AT LEAST 19 firefighters have been killed battling a fast-moving wildfire in Arizona, officials said Sunday, in reportedly the deadliest incident of its kind in the United States in 80 years. The firefighters died late Sunday afternoon while racing to contain the Yarnell Hill wildfire north of Phoenix, spokesman Steve Skurga told AFP, without giving further details. The fire broke out Friday and according to local forestry officials has already covered 800 to 1,000 acres, spreading rapidly through the dry, forested area amid strong winds. Hundreds of residents of Yarnell and Peeples Valley were being evacuated, officials said on a fire alert website, as the blaze continued to tear through the area. Prescott Fire Chief Dan Fraijo said he was “devastated” by the loss of lives. Figures from the National Fire Protection Association, a non-profit organisation, show that the Arizona deaths are the worst firefighter fatalities from a wildfire since 29 firefighters died fighting a blaze in Los Angeles’ Griffith Park in 1933. Sunday’s deaths also mark the largest loss of firefighter lives on US soil since the 9/11 attacks on the World Trade Center, when 340 firefighters were killed, according to NFPA statistics. Federal help was set to arrive on Monday, local news site the Arizona Republic reported, but officials expected at least 250 homes – about half the town of Yarnell – would be destroyed by the inferno. “This is as dark a day as I can remember,” said Arizona governor Jan Brewer, as tributes poured in for the fallen firefighters. “It may be days or longer before an investigation reveals how this tragedy occurred, but the essence we already know in our hearts: fighting fires is dangerous work,” she said. “The risk is well-known to the brave men and women who don their gear and do battle against forest and flame,” she added, offering “eternal gratitude to the fallen” and prayers for their families and friends. He later added he was in touch with local authorities and the White House and federal agencies “to ensure all resources are brought to bear”. A state forestry official told CNN the firefighters were from a local “hotshot” crew who had been digging a fire line to contain the blaze. A Facebook page has been created in memory of the fallen firefighters, showing a picture of the Granite Mountain Hotshots crew from Prescott, Arizona, with 19 people in the photo. 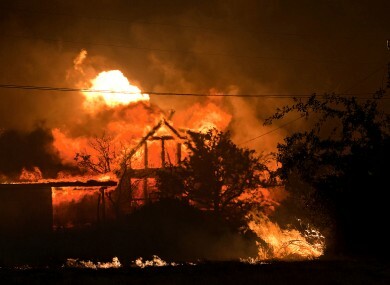 The Yarnell Hill wildfire is the worst of several blazes raging across the dry state and comes two weeks after a blaze in Colorado killed two people and burned down 360 homes, the western state’s most destructive blaze ever. The blaze started Friday and picked up momentum as the area experienced high temperatures, low humidity and windy conditions. Email “Whole crew of 'hotshot firefighters' die in US wildfire”. Feedback on “Whole crew of 'hotshot firefighters' die in US wildfire”.